Well, for the fans of astronomy-like story, this light story is better to refresh yourself after watching tons of episodes especially astronomy-like anime episodes like Sora no Manimani. The art are good though, the storyline are simple and not many characters involved, making the story is simple to relax your mind. Good story to watch and fine ending. "Hoshizora Kiseki" is kind of a strange show. It seems to be more about astronomy, but it's really a strange love story between a boy and a girl, who hit it off in an awkward and simple way, it kind of doesn't work to me, but you can roll with it. The story is fairly simple, but it's also kind of strange, because they never really explain what is the point of the boy's mission other than "It's something I have to do." I know this series was 30 minutes, but it felt like a strange addition to the show. The art reminds me of a mix of Cossette no Shouzou, and Serial Experiments Lain. I don't really like that dark tone of artwork personally. For an ONA though, this looks very good. The music has an extreme MIDI sound to it, but in that vibe of a Visual Novel, so it hasn't entirely lost its charm. The seiyuu do well enough, but sometimes they seem a bit monotonous. There are really only 2 main characters, and 3 supporting characters. They don't have too much build to them other than some of the basic things, Kozue's friend likes her "Brother? Friend?" Mystery man is the mediator to the plot point of the space fragments. Kozue is a strange person in my opinion, she seems to get happy and angry at the drop of a hat (Mainly at the beginning), and likes to annoy the people around her without trying to understand what's going on. But, she is around 14-16, so it's understandable. Ginga is basically an experiment and has to remain in a suit because the outside world will diminish his power, whatever that is. The ending has some development on Genga, so I will not spoil it. I thought this show was okay. I didn't like it too much, especially the dark art style. But I didn't hate it, and I didn't feel like I wasted my time after I watched it. It's a strange love story, not very much astrology is involved, but it may be a nice short if you have an inkling to watch one. But a much better short would be "Voices of a Distant Star" if you haven't already seen that. Hoshizora Kiseki is an astronomy anime,but it focuses much more on the relationship between the main female character,Kozue,and Ginga,the main male character. 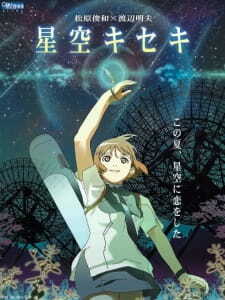 Before starting to watch Hoshizora Kiseki,I read the summary,and I thought this would be a nice anime.I am honestly not interested in astronomy,but I decided to give it a shot.When I saw that Hoshizora Kiseki was an ONA which only had one episode,I already knew that everything in this anime would be rushed in just 27 minutes.And I was right.Honestly,all I hoped for,during watching this anime,was to finish it as fast as possible.The only thing which made me not to stop from watching the anime was the story and the art. In the end,don't watch this anime when you are bored(you would definitely become much bored than before,like I did) and if you like romance anime,you'd only be disappointed,bro. I found this to be a very a cute ova. the plot is based around astronamy, so if you don't like that you best not watch it. The story is centered around ginga, who has a mysterious ability and kozue a regular school girl who loves to look at the stars. As the show goes on it becomes easier to understand the two main characters and the realtionship they share. Its doesn't appear to be romantic but rather ginga was a caged bird and kozue set him free. Overall this show was a great show that seemed to have a deep meaning.